This page is divided into 2 sections – the various master cleanse products and the shopping list for the master cleanse. We will start with the master cleanse ingredients here - where you can purchase at the lowest cost online and how much does it cost. Full master cleanse ingredient kit. 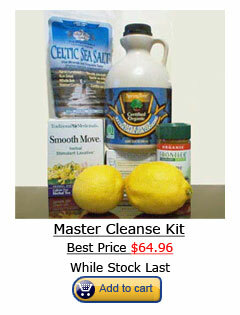 We have found the 2 main suppliers and here’s the cheapest price you can find for the master cleanse kit. One is sold from Amazon and the other is from the main supplier. As you can see, Amazon is selling at $69.15, and the other supplier is selling at $64.96. A lot of people have purchased from both suppliers and we had verified that they are honest businesses you can purchase from. Organic Maple Syrup Grade B 64 Oz. Here’s also 2 suppliers you can purchase from. Amazon is selling at various prices and below is the lowest price $44 from Amazon. For the other supplier, it is selling at $42.95. So you save $1.05 if you bought from the other supplier. When you are about to embark on the Master Cleanse diet, take down this shopping list before going to the grocery store. Around 40 large lemons which is enough for 5 days. You don’t want to buy too much since it will not be fresh any more. You would also want to buy organic lemons because you are cleansing your body and you don’t want to add toxins to your body. After you used up the lemons after 5 days, you can start buying lemons again. These ingredients are based on 10 day master cleanse diet with around 8 glasses of lemonade a day. If you would like to drink more, than you need to adjust the amounts yourself. i am beginning day 1 of my journey , iungry or feeling anything , but i am having difficulty consuming the servings of the lemonade ect… Question , is it supposed to taste strong cayenne ? and in one day am i supposed to consume 6-8 servings of the juice per day 8ounces ? just to confirm ! thanks ! @MONICA : Buena suerte. ¿Escribes Inglés? Can I drink water during this diet, or I can only drink the lemonade? I understand that you can do the Master Cleanse a min of 10 days with a max of 40-45 days.How soon after doing the Master cleanse can you start the cleanse up again if you decide to do a 40 day cleanse?? Can I continue to take my daily multi vitamins? Can you drink extra water along with the lemonade? And is it dangerous for teenagers ? Keli, as long as you are breastfeeding, you should not be on the Master Cleanse. I have read this from Burroughs’ book. I am winding down from nursing my toddler. But not ready to stop and feel this cleanse will help for health reasons. Will this affect breast milk? Should I be concerned the salt will go through my milk to my child? Do you need Distilled water or will regualar bottled water work? for the 6-10 glasses, you need to drink at least 6 servings of lemonade a day and can go up to 10 servings of lemonade. So it’s alright you drink anything in between. I’m not sure what you mean by double the batch for day 2 and day 3. But you don’t want to prepare too much lemonade at a go as it would turn bad (the lemons have a different taste) after 8 hours. And that applies to the lemonade in the fridge. I’m beginning tomorrow and I have read 6 – 10 glasses of lemonade a day, which is correct? Also, in order for me to do the cleanse I need to double the batch for day 2 and 3 due to my work and school schedule, I’ve read it goes bad, what does this mean?